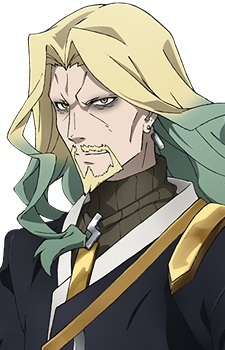 Kuro no Lancer "Vlad III, The Impaler Prince"
Lancer of "Black" is the Lancer-class Servant of Darnic Prestone Yggdmillennia of the Black Faction in the Great Holy Grail War of Fate/Apocrypha. Lancer's identity is Vlad III the Lord Impaler (1431-1476) and the greatest hero of Transylvania, whose feats in war caused him to be known fearsomely as the "Impaling Prince" to the Turks. Due to the legends associated with him, another name has been spread across the world, The Little Dragon, better known as the vampire Count Dracula. While the nation was small, he was a hero who ascended to the throne and managed to turn back the numerous invasions of the Ottoman Empire that had trampled over every other country. Though the model for Dracula, he was not a vampire, but a man of devotion and great hero.